In today’s world of free speech, free thought and free Wifi, we all like to be masters of our own destiny from time to time. What we rarely realize is that this requires an understanding of our personality, of the words we utter, of the symbols we use to signify our subjective reality and in the simple terms of body language – of what physical gestures we use in our everyday life. 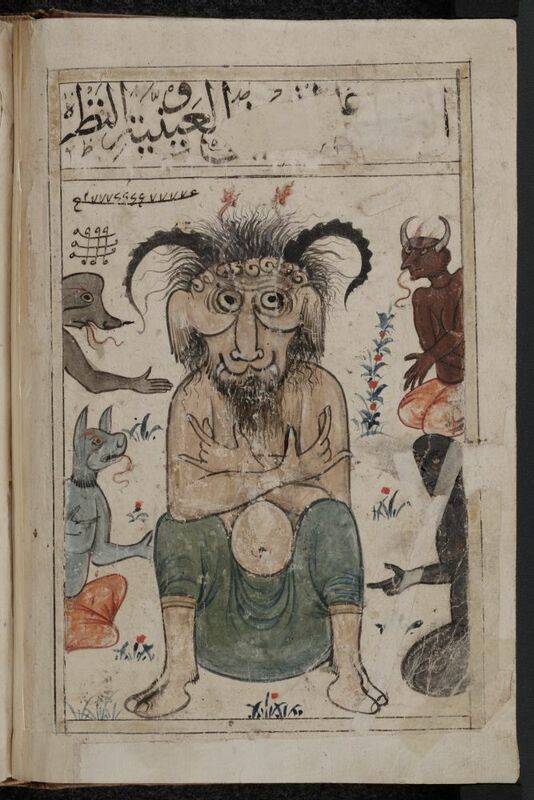 One of these gestures, concerning mainly those of us with a little extra darkness in our souls, are The Horns. Ah, The Horns. A.k.a. 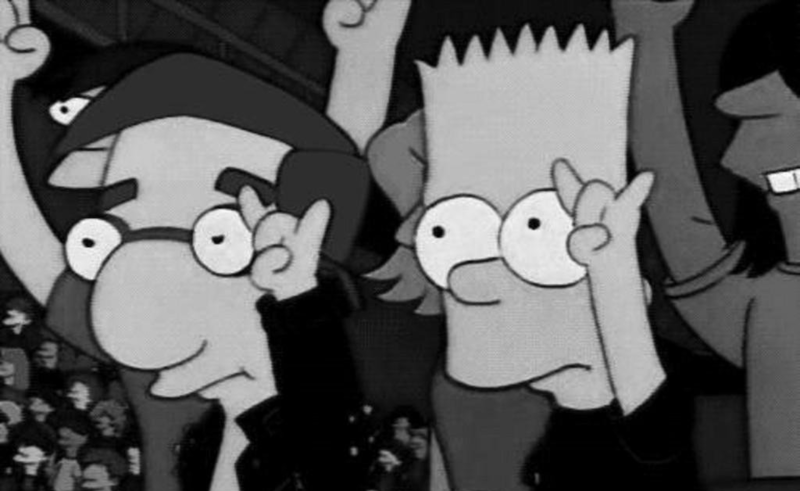 The Devil’s Horns, Metal horns, The Metal Sign, etc. You raise your index finger and your pinky, parents nod their heads in disapproval, nuns faint, angels cry and you’re just having a good time listening to another awesome Motörhead solo. Where does it come from, many of us wonder, this weird gesture with its distinctive finger configuration. It almost looks as if you’re giving someone the finger but it’s the wrong finger(s). Doesn’t this flipping-someone-off vibe match the sign’s heavy metal connotations perfectly? Yes and no, turns out. So, you ask, how did it enter our pure, civilized culture, free of ill will and menacing symbolism? Well, just like half of the greatest science discoveries in history, which were made simultaneously by different people, in different parts of the world, The Horns crawled up on our modern quotidianity from different directions – religion, sports, music, pop-culture – not leaving us any choice but to accept it into our sad, little, dark, gullible, superstitious lives. 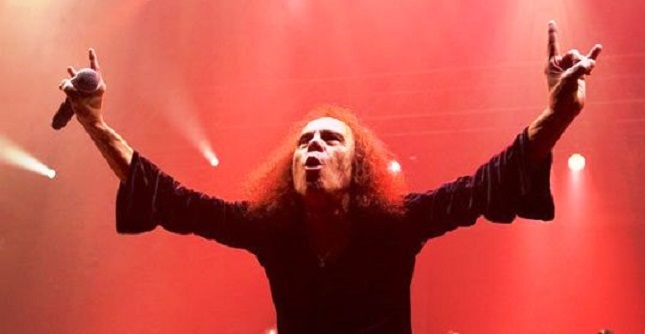 If there’s one person who’s usually associated with the Horns, it is, of course, Ronnie James Dio – the rock deity most famously known for his work as main vocalist of Black Sabbath and Rainbow. In fact, Ronnie has done so much to popularize the sign, many people believe he was the one who originally came up with it. Luckily, Dio himself was not among those people and there’s more than enough historical evidence to discourage such a claim. The rock and roll icon has stated numerous times that he borrowed The Horns from his Italian grandmother who used it to ward off the “evil eye”. In Mediterranean culture the “evil eye” (malocchio) is the look that someone gives you if they’re jealous or envious. In Italian folklore (and in basically every other folklore, ever) this can cause you real harm, physical pain, misfortune, etc. It’s like putting a curse on someone. To protect yourself from this “evil eye”, you can choose from a variety of superstitious counteractions, among which – the hand gesture you normally use at metal concerts. Weird, huh? In different parts of the Mediterranean region the sign can mean different things, although it’s always related to the “malocchio” concept. For example, you can use it offensively, openly stating you wish someone harm. To “curse” a person you would need to point your fingers upwards or direct them aggressively towards them and swivel a little. By the way, these symbols are always very universal in their usage – there doesn’t have to be a person cursing you for you to use The Horns. It can simply be a way to chase off bad luck or an equivalent of knocking on wood in Western culture. A famous example of this is when Giovanni Leone, a former president of Italy, made the sign behind his back while shaking the hand of a cholera patient in Naples. What slipped his mind was that a bunch of journalists and photographers were also standing behind his back. The moment was documented and caused a real scandal throughout the country. More recently, in 2002, former Italian prime minister Silvio Berlusconi was photographed performing The Horns behind the back of the Spanish foreign minister during a meeting of the European Union. But you can’t be too judgmental – after all we’re talking about a region where a common way for a male to prevent misfortune is to grab himself by the balls. Seriously. Well, it would be a very old-fashioned, superstitious male, but still – funny stuff! The corna sign is also popular in Latin America, Greece, Southern and Western Europe but its origins can be traced East – to India. There gesture is known as Karana Mudra, commonly used by Gautama Buddha (who was actually born in Nepal) and its purpose is the expulsion of demons, overcoming of obstacles, removing or preventing sickness and negative thoughts. It’s funny seeing Buddha himself rocking out and pretending you don’t know what it means. Ah, ignorance is giggles. Now, back to modern times. We said Dio took The Horns from his grandma but we didn’t say why. Well, metal titan Ozzy Osbourne had just been fired from Black Sabbath when Ronnie joined the band in 1979. Ozzy was famous for using the piece sign a lot (although I would call it abusing, since we’re talking about someone who bit off the head of a real bat on stage) and Dio needed something to continue the tradition without copying his predecessor. The Horns, I hope we can all agree, worked just fine. What Dio probably didn’t know was that the Horns were used by other musicians before him. In 1969, a whole decade before he joined Sabbath, a band named Coven put a photo of the band members showing the gesture on the back of their album Witchcraft Destroys Minds & Reaps Souls. Lead singer Jinx Dawson would often use the sign at concerts and the crowd would often return the gesture by raising their index finger and their pinky in the air to show their appreciation for the performance. 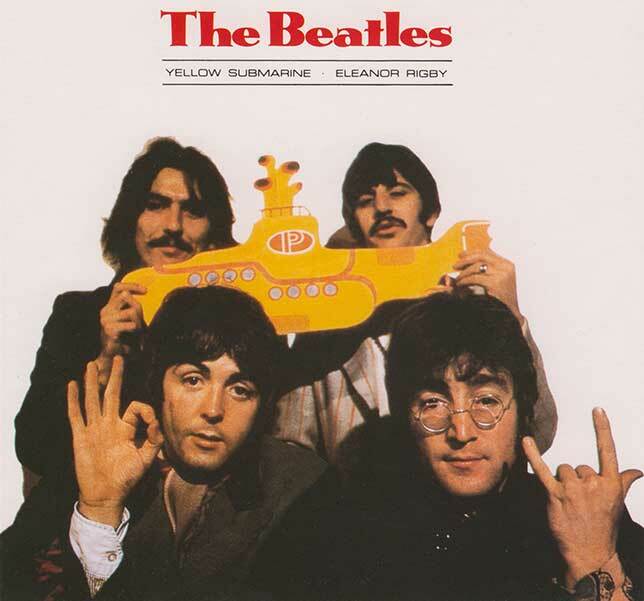 Another famous musician who’d been using the gesture long before Dio was, surprisingly, John Lennon – this becomes clear from a photo of the band around the time of Yellow Submarine. The Horns also appeared in one of the Beatles’ cartoons but rumor has it that the animators mistook the corna for the “I love you” sign in American Sign Language. 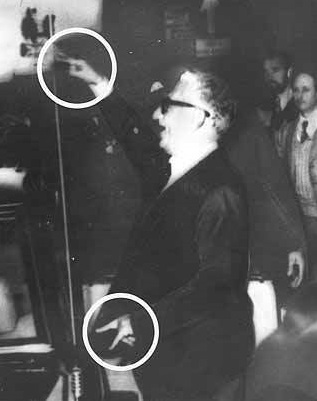 This is most probably not true, because the cartoons were based on multiple photos of Lennon showing the sign in 1967. However, it would have been an honest mistake, seeing that the two gestures are suuuper similar. So similar, in fact, that many use the ILY sign at heavy metal concerts. Which is weird. If you’re one of these misguided souls, please stop, you don’t have an excuse anymore. Just keep your thumb on your middle and ring finger and everything should be okay. Thank you. As we can see, in addition to being mistakenly associated with demon summoning and worshiping Satan for many, many long centuries, despite their apotropaic origin (probably a new word for you, means something like “warding off evil influences”) The Horns have been appearing in pop-culture for quite some time. The sign was known as the “P-Funk sign” in 70’s pop culture through Parliament-Funkadelic’s science-fiction mythology. Frank Zappa can also be seen showing the gesture in the 1979, although probably jokingly. A painting of Gene Simmons (the internationally disliked as a person and adored as a vocalist lead singer of KISS) from 1977 depicts him utilizing the sign. Even before that, as early as 1955, Marlon Brando uses the corna as a symbol for snake eyes during a game of craps in the film Guys and Dolls. The corna, believe it or not, also appeared in many Disney movies. This, however, is probably more related to the neopagan uses of The Horns – for example, it’s used to represent the Horned God in Wicca. And sometimes Disney’s just weird like that. The corna have transformed so many times throughout the years, it’s difficult to say where they appeared first. Sports is one possibility, although it kind of seems things there happened independently from music or pop-culture. 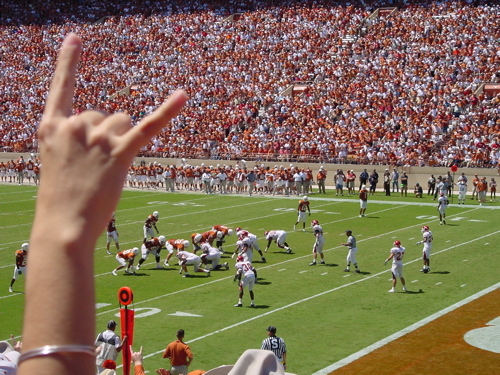 “Hook ’em Horns” is the famous slogan and hand signal of the University of Texas at Austin. But fans of numerous other college teams use the same or very similar gestures – the University of South Florida Bulls, the North Dakota State University Bison, the North Carolina State University Wolfpack, Northwestern State University Demon and many others among which, and I promise you this is the truth, the University of California, Irvine Anteaters. Yep. Anteaters. No, Ronnie, it didn’t. It will live forever, just like you.